Tender chicken with a rich sauce made with a touch of Marsala wine is a craveable winning combination. This dish is always a request of my family and one of my favorites as well. Chicken Marsala is one of those dishes that’s found on just about every Italian restaurant menu, but it’s easy to make at home. Trust me, you’ll be happy you decided not to order out! Chicken Marsala is a versatile dish which is easily accompanied by your favorite sides. Asparagus, peas, stuffing, egg noddles, pasta, cauliflower mash, potatoes are all amazing choices! Trader Joe’s makes a delicious Mushroom Medley that’s sold in their freezer section. 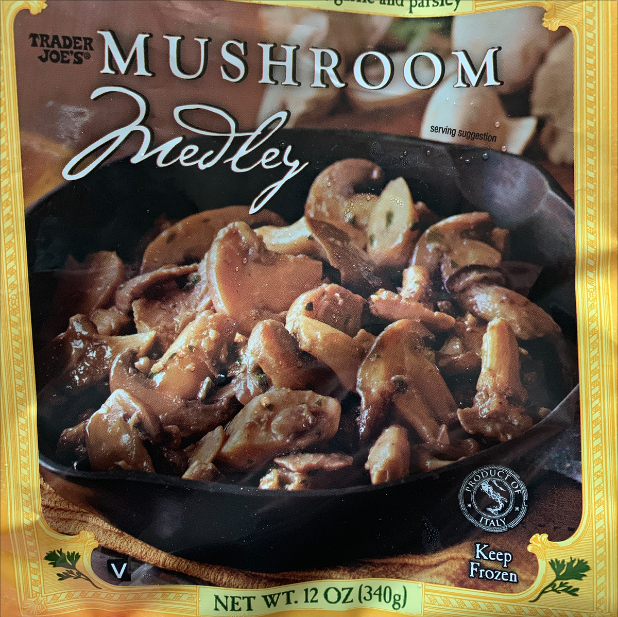 When I don’t have fresh mushrooms on hand, I use a bag of this Trader Joe’s Mushroom Medley instead. It more than fits the bill. The blend has garlic and parsley which is perfect for the Marsala! This product is not certified gluten-free, use fresh mushrooms if there is any concern. 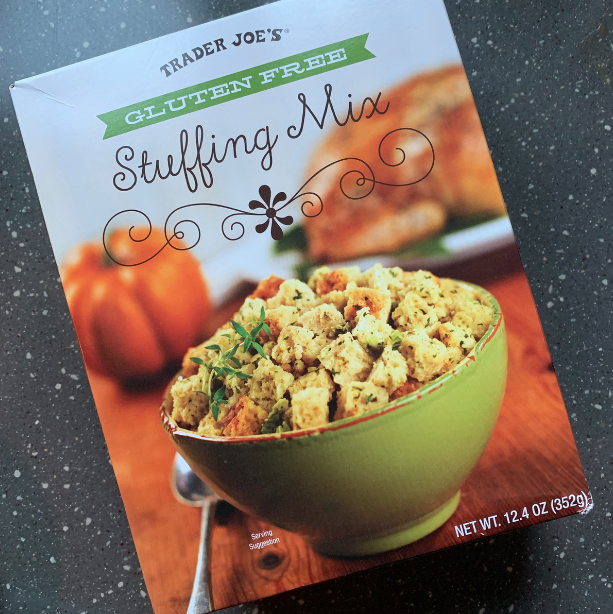 Trader Joe’s Gluten-free Stuffing Mix is my go-to when I’m wanting to go all out with the comfort food. 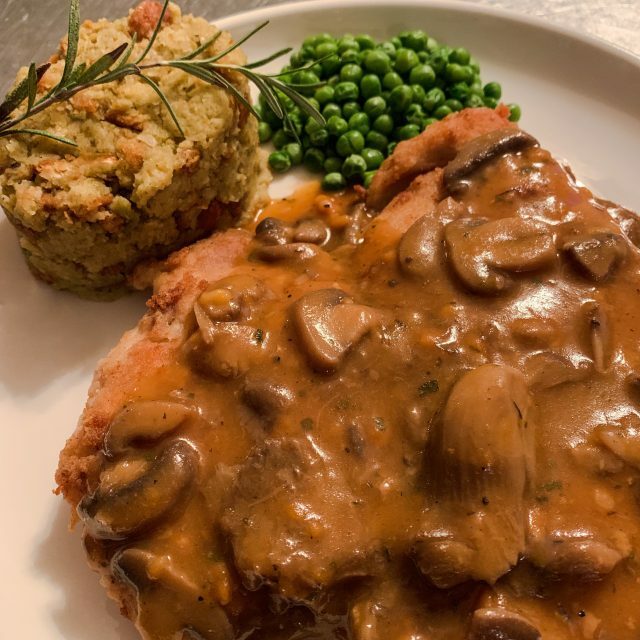 It is easy to make as any stuffing mix and a great option as a side for my Chicken Marsala recipe. 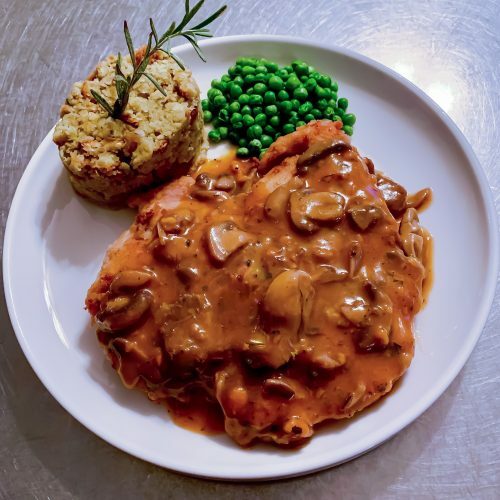 Chicken Marsala is a versatile dish which is easily accompanied by your favorite sides. Asparagus, peas, stuffing, egg noddles, pasta, cauliflower mash, potatoes are all amazing choices! I hope this recipe makes your family as happy as it does mine. 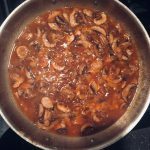 Who needs to order out when you can make this amazing version of Chicken Marsala right in your own kitchen. Slice the chicken breasts in half horizontally to make 4 cutlets. Put each cutlet between two sheets of plastic wrap and lightly pound them until they are about 1/4 inch thick. Season liberally with 1/2 teaspoon salt and a pinch of black pepper. Place flour in a shallow bowl and lightly dredge the chicken pieces in the flour, shaking off any excess. Reserve the 1 tbsp remaining flour to use later. Heat a large nonstick skillet over medium-high heat. Add 1/2 tablespoon of the butter and 1 teaspoon of the olive oil to the pan and swirl the pan until the butter has melted. Add the chicken and cook until golden brown on both sides, about 3 minutes per side. Transfer to a baking dish and place in the oven to keep warm. Add the remaining 1/2 tablespoon butter and 1 teaspoon olive oil to the skillet. Add the garlic and shallots and cook until soft and golden, about 2 minutes. Add the mushrooms, season with 1/8 teaspoon salt and a pinch of black pepper, and cook, stirring occasionally, until golden, about 5 minutes. Sprinkle in the reserved 1 teaspoon of flour and cook, stirring, for about 30 seconds. Add the tomato paste, Marsala wine, chicken broth, and herbs de provence. Stir and scrape up any browned bits from the bottom of the pan with a wooden spoon, until thickened, about 2 minutes. For gluten-free version, use gluten-free flour and stock. Trader Joe's Mushroom Medley is not certified gluten-free, use fresh mushrooms if there is any concern.